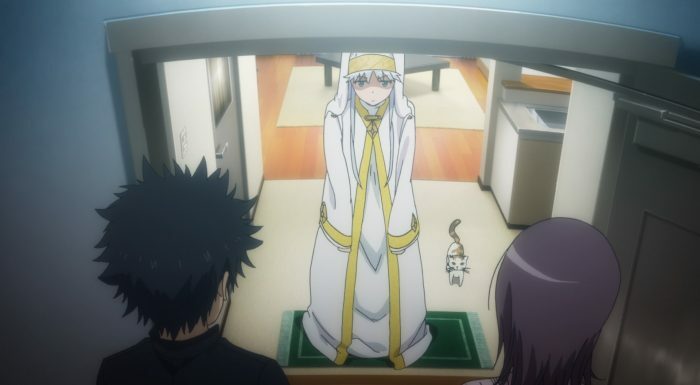 Every time we get a good episode of To Aru Majutsu no Index III, I get a little worried. Granted, this specific situation has only occurred twice thus far, but what’s significant is that both cases featured an arc beginning episode. So yes, the show’s latest story arc has certainly been setup well, with both the pacing and over-exposition issues nowhere to be seen. 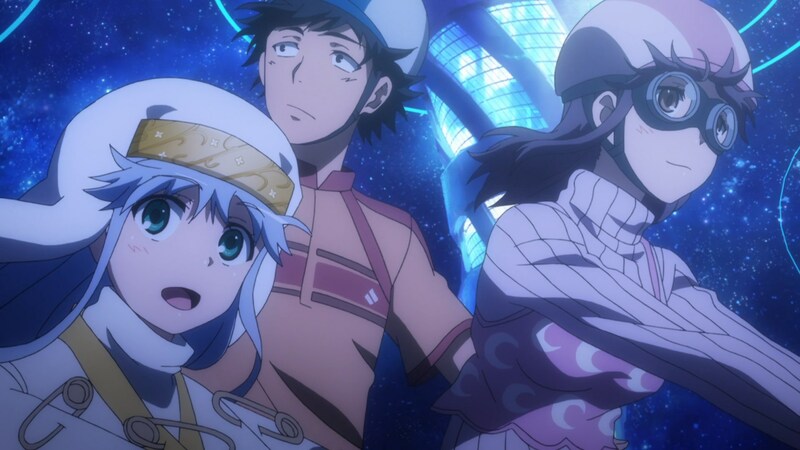 Of course, we started the last arc in much the same way, so it remains to be seen if Index III can really nail both the landing and more importantly the journey itself after the initial takeoff. Future aside, I will say that this episode was REALLY good. This episode, was kind of what I was looking for in season 3. A good paced story, with some nice mixes of comedy, slice of life, an exploration of academy city itself and a solid threat with some surprises strewn out here and there. Everything this week was pretty close to flawless actually, from the start of the episode to the end. So… Where to begin? Where to begin? Well… For starters, I really liked the little comedy lunch lunch scene that the episode opened up with. With everything that Touma has been through, its easy to forget that the guy is still in high school. Seeing him kind of act a little silly, like an actual teenager, was a nice change of pace. It also established, quite nicely, a sense of calm and peace before things went south later on in the episode. In fact, if there was one way to describe the majority of this episode, it would be “leisurely”. The episode is about an approaching threat coming, but most of it is actually giving the audience context for how things have kind of calmed down since the last few arcs. Itsuwa’s arrival for example, is something that’s treated as a really a nice surprise. She adds a good dose of just general positivity to Touma’s life. There’s a good amount of loitering, laughing and just general fun once Itsuwa appears. And of course., with Itsuwa comes the inevitable discussion regarding Touma and the small harem that he’s most certainly accruing as the story progresses. 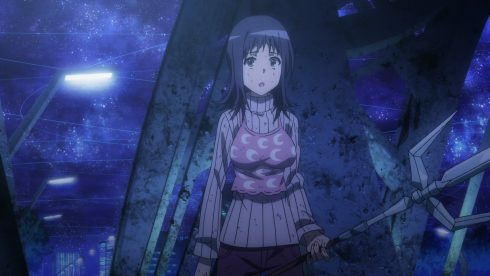 We’ve got Itsuwa, Misaka and maybe Index (I’m personally not entirely sold on that one) as the first string, with a second string consisting of characters like Fukyose and Kanzaki. Now, I have to say, While I’ve been beating the drum for Misaka pretty hard until now, I’m starting to shift my opinion a bit. Itsuwa is just a joy to behold, and she’s SUCH a refreshing change of pace from literally every other female character that Touma interacts with. She’s earnest, she’s straightforward about her interest, and she’s shy but still manages to push forward and actually try to, you know, win Touma’s affections. And the really interesting thing? I’d say its working, kind of. I mean, just take a look at Touma’s other relationships with the girls he;s around. They either boss him around, or need something from him. Take Index as an example. 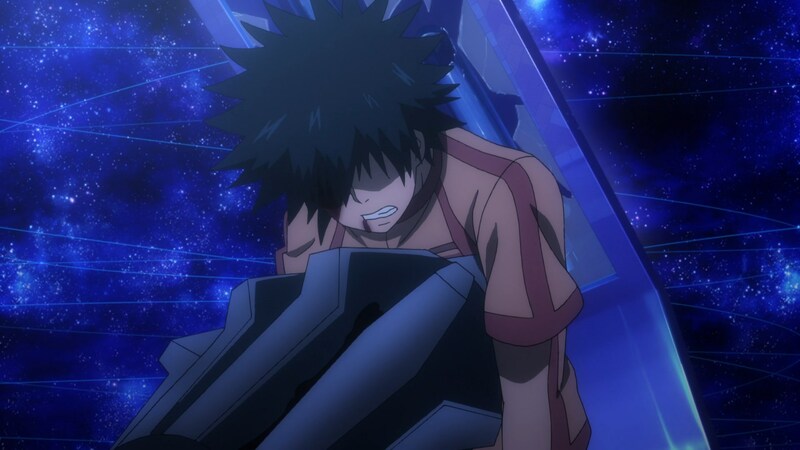 Touma takes care of Index, but Index is a little brat and seems to give him no end of trouble. 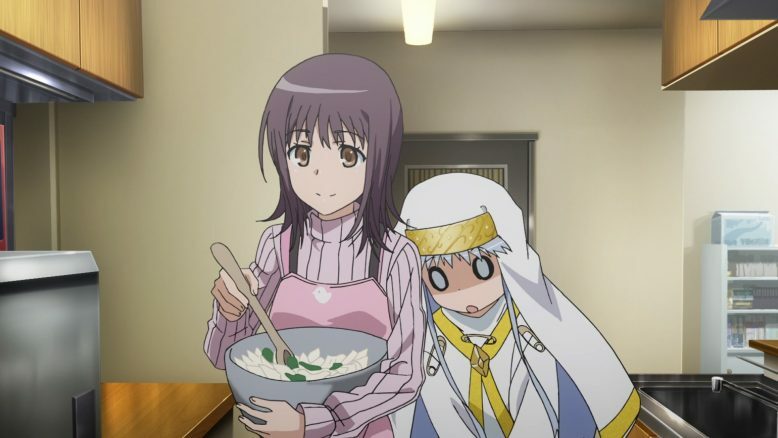 Sure, Index might be living with Touma, but she’s nothing more than a person that’s entirely dependent on him and can’t really fend for herself. Plus. personally, I don’t get any chemistry between them at all, and see more of a sibling like relationship. In contrast, its always been Misaka, in my mind, that actually had a shot with Touma. Now? I’d say even she is getting beat by Itsuwa. Misaka’s definitely a major player in the RailDex verse, but its clear that the show and the franchise are not interesting in actually doubling down on idea of her and Touma together. Misaka is always there, and she’s got a crush on Touma, but her pride and general tsundere-ness is what’s kind of making her miss out. I don’t think Misaka is unlikable, nor do I think that she’s over the top. I actually relate to Misaka the most, because of how much she resists and fights against the feelings that she clearly has. Even she knows her and Touma aren’t a great match, or even a good idea, but the poor girl can’t control her feelings. So She’s in the situation that she’s in, and I really enjoy how the show constantly pust Misaka in this sort of weird, uncomfortable head space this week. Misaka has no idea what her relationship is with Touma. The fact that she knows about his memory loss, is actually a big thing that I think could drive her closer to him, but right now, she’s very much the outsider. So yeah, I feel for Misaka, especially because the way her feelings are being handled in the show, are pretty darn well done. Itsuwa, though, is just better at the whole “liking” someone thing than well, any of the other female characters listed. Her one hang up, is of course, that she’s shy, but the way she goes about her crush, is a lot more heart warming to watch. Itsuwa coming in to “protect” Touma and then using that as an opportunity to get close to him? That’s fair and nice. Cooking for him, helping him out, and then taking him to the “Third Level” of Academy City’s 22nd School District, are all cool things. And yes, I enjoyed the little moments that the peanut gallery had with regards to Itsuwa and Touma. The whole Amakusa gang is pretty funny and odd now, and seeing them kind of enjoy and root for Itsuwa while guarding Touma, was one of the episode’s more solid bits. Plus. its in one of these Amakusa moments, that the show organically throws in some world building and mythos hints. 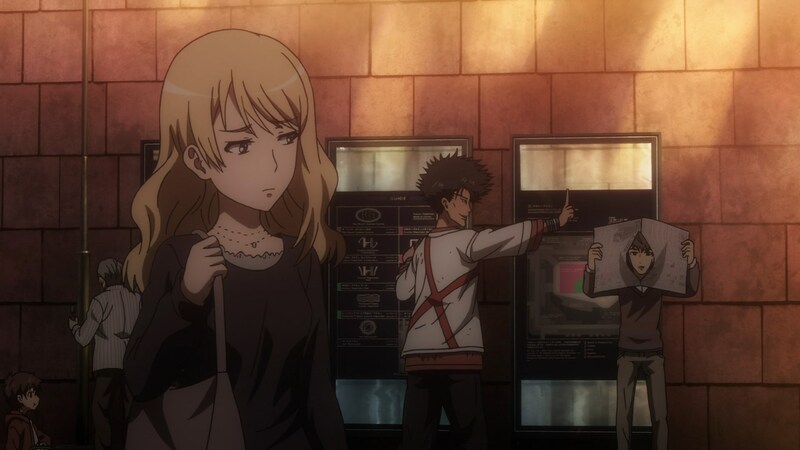 See, the focus of this episode and the premise, is that the right seat of god, the organization that Touma’s been thwarting recently, is now targeting him directly. The strongest member, Acqua (who we’ve already seen decimate Terra) is now completely gunning for Touma. Which, I think, is a simple enough story and idea, allowing the anime to actually keep a decent pace and not have to work too hard to adapt it. Thre’s no complex terms here, nor are there a lot of moving parts. Sometimes simple really is the best kind of story. But… Getting back to the world building stuff, its very notable that Acqua is targeting Touma specifically. Its not just Acqua either, as Tatemiya (remember him from Season 2?) notes quite aptly. 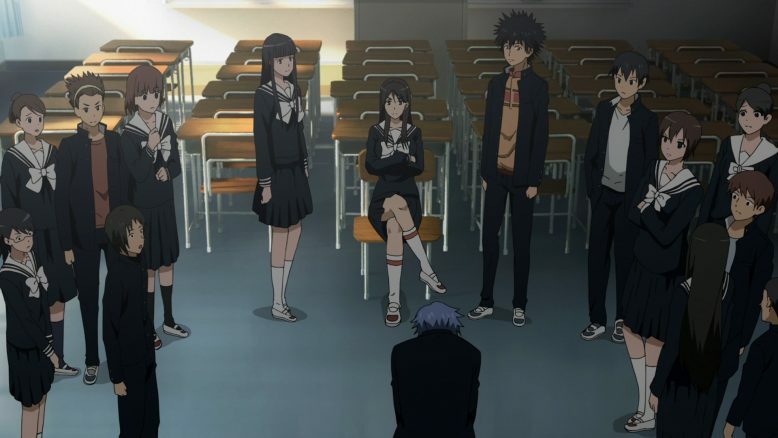 Its certainly strange that there are three separate factions are all fighting over Touma. 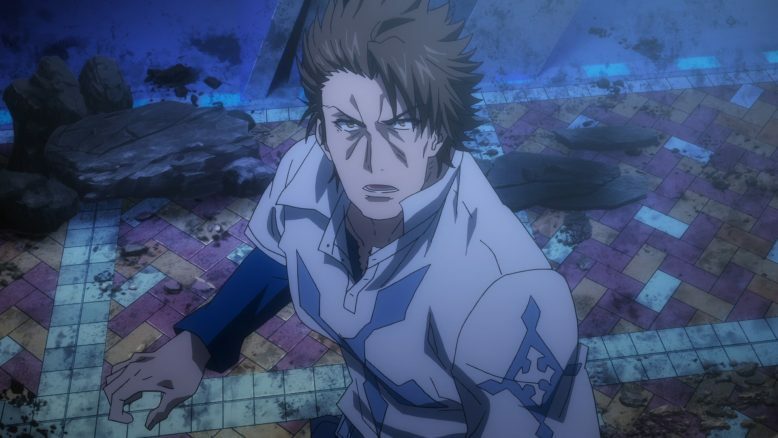 Plus, given the little facts that Terra revealed in the show’s first arc, its easy to see that the show has a bit more planned for Touma, his Imagine Breaker and whatever secrets are still uncovered with regards to that. Of course, while most of the episode is Itsuwa, Touma and Index chilling and relaxing, things do ultimately go south when Acqua himself appears. Its interesting to note that when that does happen, both Index and Misaka are out of the picture for various reasons. 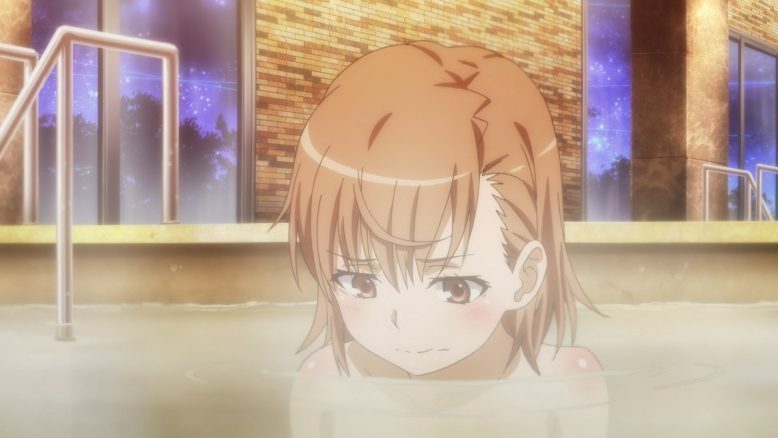 Index is off chasing food, and Misaka ends up spending too much time in the Level three spa bath, and is whisked away earlier in the episode. So, ultimately, when Acqua does appear, he’s got the advantage and pretty much owns everybody involved. The Amakusa group is pretty much taken down off screen, and Itsuwa and Touma follow suit soon after. 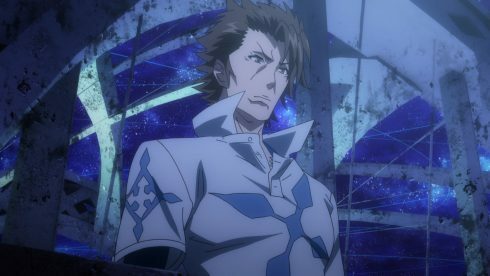 Itsuwa, understandably, can’t do much about Acqua, who’s known to have saint level abilities (think Kanzaki level of power). Touma, for his part, is really powerless. The whole scene with Acqua is a stark reminder of the fact that beyond having the Imagine Breaker, Touma really is just a normal human. There’s no super speed, there’s no fantastic fighting ability, Touma is very much out of his league here. Acqua knows this, and instead gives Touma a choice; Rip off his arm or die. To Acqua, Touma’s big problem is more so his Imagine Breaker, and if that thing can be neutralized, then Touma himself can be left alone. Understandably, however, Touma refuses to take the easy way out and tells Acqua to screw himself. This then, starts a rather one sided battle. Touma resists the best he can, and even puts on another brave face for Itsuwa, who tries her best to support him but can’t because of his Imagine Breaker. That thing, despite its power, does have its share of problems, and of course, Touma fighting against Acqua has him at a severe disadvantage. Acqua uses physical attacks and speed, and Touma’s Imagine Breaker, is once again, quite useless. 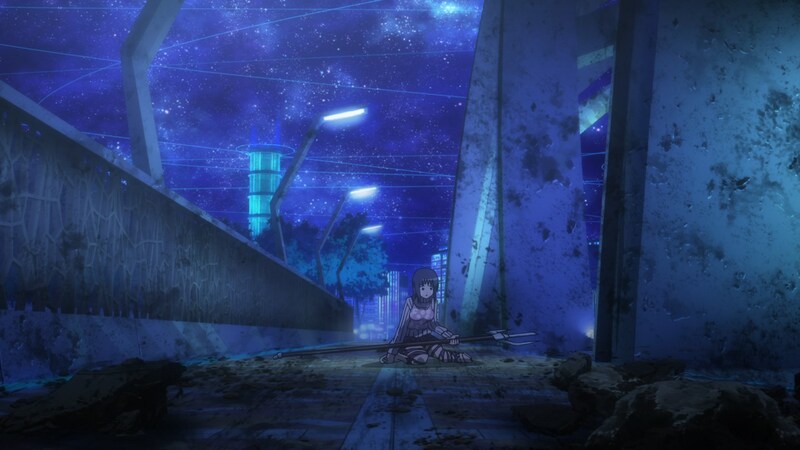 So we end the episode, with Touma being flung off the bridge he encounters Acqua at, rather violently. 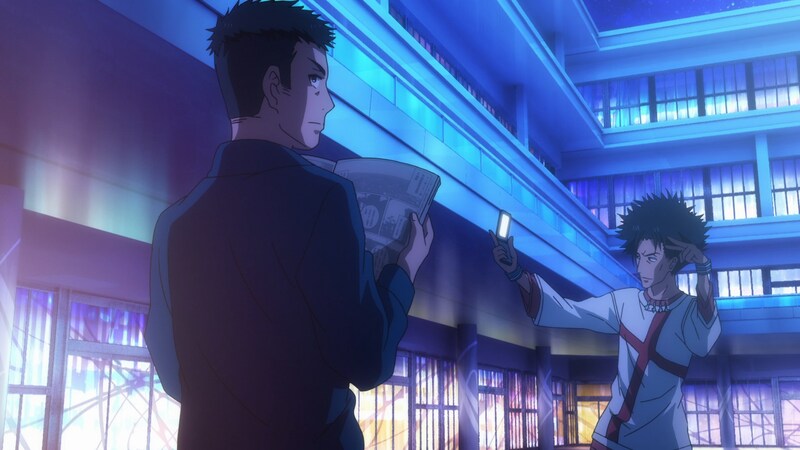 Acqua doesn’t finish the job, however, and gives Touma a day to make his decision regarding the earlier offer. 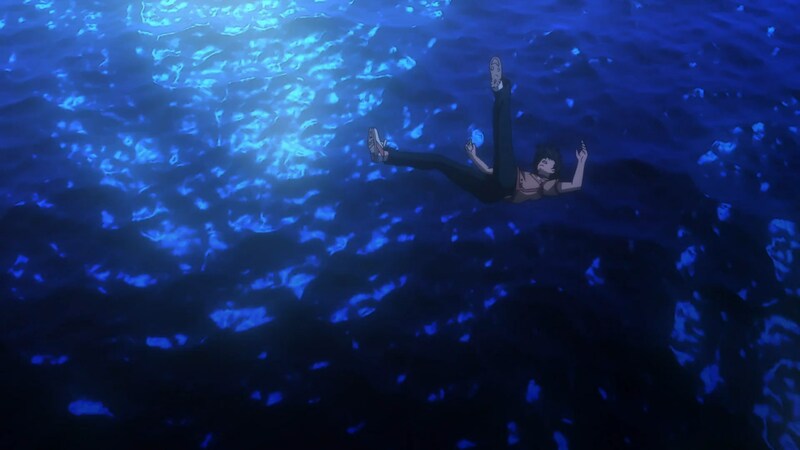 Things look pretty grim, as Touma falls into the water, Acqua leaves and Itsuwa just drops to her knees in despair. Its quite clear that everyone facing off against Acqua, is completely outmatched. So, what exactly does Touma do this time? Can he do anything? 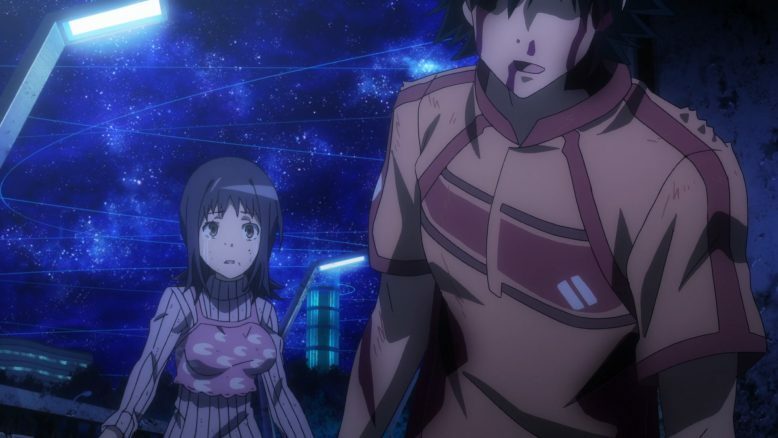 My gut says that Kanzaki is going to come in and help. She’s related to the Amakusa, owes Touma a few favors and of course has been name dropped a few times already this week. We’ll have to see if Kanzaki appears soon, or if Touma and Itsuwa are going to manage, somehow, by themselves. Overall though, I’d say this was a good episode. I enjoyed almost everything about this week’s episode, and it was nice to at least feel like the show wasn’t rushing through anything. I didn’t mention r/anime’s thread this week, or Razorhead, because I honestly didn’t go and read either after watching the episode. I didn’t feel the need to, and that’s a big compliment to To Aru Majutsu no Index III, because this is the FIRST episode, where I’ve felt satisfied from JUST watching the show itself. Hopefully that’s the status quo from this point forward, because well, its been downright depressing to be a fan of this franchise for the last few weeks.